On Friday, Feb. 6, Wilfrid Laurier University’s School of Business and Economics hosted its sixth-annual PepsiCo Pitch Competition. The competition, which introduces over 1,000 first-year Bachelor of Business Administration (BBA) students to the "art of the pitch," features students' individual two-minute "elevator" pitches for a new business idea. All first-year BBA students participate in the initial assignment, with the top two students in each lab advancing to the semifinals of the competition, where they presented their pitch to teaching assistants and alumni judges. After 12 finalists were selected, the top students presented their pitches again to a panel of entrepreneurs and external business community members, who then narrowed it down to the top three. Scholarships and PepsiCo plaques were presented to all 12 finalists, and the top three students received guaranteed interviews with PepsiCo. “I was so incredibly proud of the students,” said Laurier professor and major contributor to the event, Laura Allan. "They learned an important skill, and impressed every one of the external judges, as well as the dean and the associate dean. We truly do have the most talented business students in our program." The widely popular competition aims to strengthen first-year BBA students' presentation and communication skills as well as their ability to be both professional and persuasive. Along with the fun and excitement of the competition, all students involved in the finals were treated to a reception and entertaining speech, courtesy of Laurier SBE alumnus and Dragons' Den judge, David Chilton. 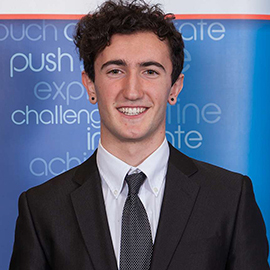 "I think Laurier has done an outstanding job providing students with opportunities outside of the classroom like this one," said Angelo Fousteris, winner of the competition. "It's a great way for students to compete and challenge each other to do so."